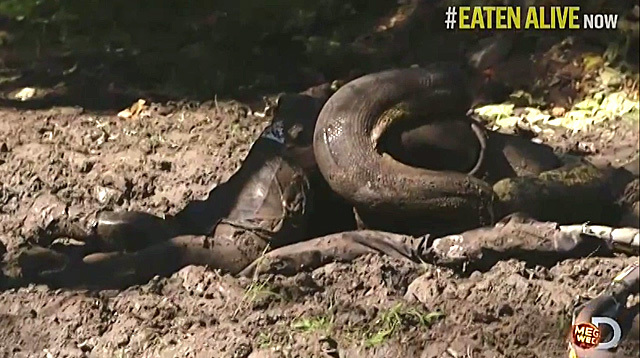 Remember the guy who volunteered to be eaten alive by an anaconda for Discovery Channel’s TV special called Eaten Alive? Well, let’s just say things didn’t go exactly as planned. The show’s producers hyped up the big event with video clips of Paul Rosolie and his team tracking down the anaconda and preparing Paul for his head-first dive. Naturally, viewers were expecting to see Paul actually getting eaten alive (as the show’s title suggests,) but it turns out he barely even made it inside the snake’s mouth. In the clip below, the anaconda wraps herself around Paul tightly for an hour, causing Paul’s arm to be crushed despite his body armor. He alerts his team to be on standby as the snake tries to swallow his head. He eventually taps out and asks his team to help him when he feels his arm is about to break. The show may have failed on this mission, but at least it succeeded in raising awareness about the Amazon and its biodiversity. That was the point of this whole thing, after all. A lot of people were still pretty pissed about the show, though. So Paul appeared on Jimmy Kimmel Live to talk about his failed stunt. Watch the interview below!